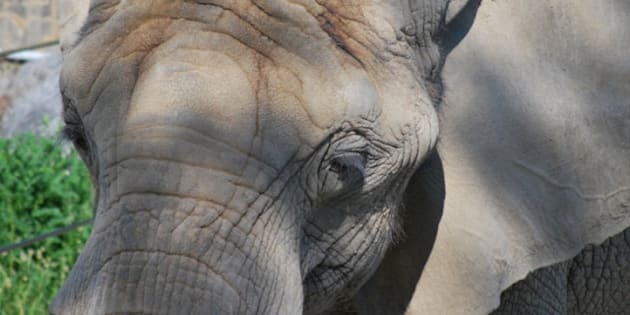 TORONTO - With sad hearts, staff at the Toronto Zoo are starting the long process of preparing three aging elephants for a move to a California sanctuary. Toronto city council voted 31-4 Tuesday night to send the giant beasts south the border to a warmer facility with more open space. John Tracogna, CEO of the zoo, said Wednesday it will take at least four months to get the necessary export permits and to train staff on how to safely ship Toka, Thika and Iringa. The female African elephants, which range in age from 31 to 42, each weigh between 3,600 to 3,800 kilograms. They are crowd favourites. "I spoke with the keepers who care for the elephants day in, day out, and there is a lot of emotions there and mixed feelings," Tracogna said, adding some fear the animals will be so stressed by the move they could die. "It is a risk that people need to consider." The elephants are to be secured in special crates and face at least a five-day road trip by transport truck. It's possible they could be flown to the California in a large transport jet. The vote to send the elephants south follows a campaign by animal rights activists, including former game show host Bob Barker, who argued that Canada is too cold for pachyderms. Cash-strapped Toronto also faced the prospect of having to build a new $16.5-million facility for the elephants. Barker and groups such as People for the Ethical Treatment of Animals have also targeted Edmonton's Valley Zoo, which is home to Lucy, a 36-year-old Asian elephant with health problems. Mary Lou Reeleder, a City of Edmonton spokeswoman, said Toronto's vote will have no bearing on Edmonton's long-standing decision not to move Lucy to a similar U.S. animal sanctuary. "The Edmonton Valley Zoo is making the decisions they feel are in the best interests of Lucy," she said. "Lucy is an individual elephant with unique needs and she must be understood and treated as an individual animal." Last month, animal rights groups asked the Supreme Court of Canada to get involved in the battle over Lucy's fate. PETA and Zoocheck have applied to challenge an Alberta Court of Appeal split decision that ruled against their plan to sue the City of Edmonton over Lucy. The City of Edmonton plans to oppose the leave to appeal application. Lucy suffers from arthritis, obesity, foot infections, dental problems, bed sores and chronic respiratory issues. The city says despite her ailments, the elephant is well cared for.